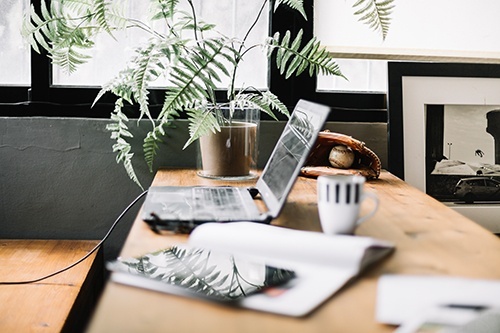 Whether you work from home full-time or part-time, having a designated home office can significantly improve your productivity level. Even if you don't technically “work from home”, such a space is ideal for maintaining and organizing things like bills, reports, and calendars. Plan out your electrical needs. If you have a desktop computer, you will need to consider the cords necessary for the monitor, the system unit, speakers, modem, and printer. Make sure whatever room or corner of your house you designate as the home office has sufficient electrical power and outlets to handle your utility needs. Consider investing in high-quality surge protectors that will prevent brief spikes in voltage from harming the electrical components of the equipment in your home office. Invest in an ergonomically designed chair. If you spend 4+ hours a day sitting, treat yourself to a comfortable and well-designed chair. As you begin your research of the perfect work chair, you'll see options focusing on pelvis balance points and free shoulder technology as well as ones boasting the best in foot and elbow rests. Take a full day just to go out and experiment with the rich variety of chairs that are available. Keep natural lighting in mind. Good lighting is an essential component of good work and life habits. In fact, a recent study found office workers who lacked exposure to daylight got, on average, 46 fewer minutes of sleep a night, while another study found that natural light can boost employee productivity. One of the biggest advantages of designing your home office is that you can control where and how much natural light you get. Choose a sunny room to enjoy the health and benefits of natural sunlight, but consider installing interior window shades to control lighting, while ensuring privacy. Polar Shades’ products can help reduce sun glare and prevent UV rays from damaging your furniture. Not sure what the perfect balance of natural light is? Contact our team today at 877-260-6110 for a free in-home consultation to help you determine the best shades for your home office.